Last night my cousin Sarah Nic Pháidín and I drove to Thoor Ballylee, some 30 kilometers or so outside Galway. 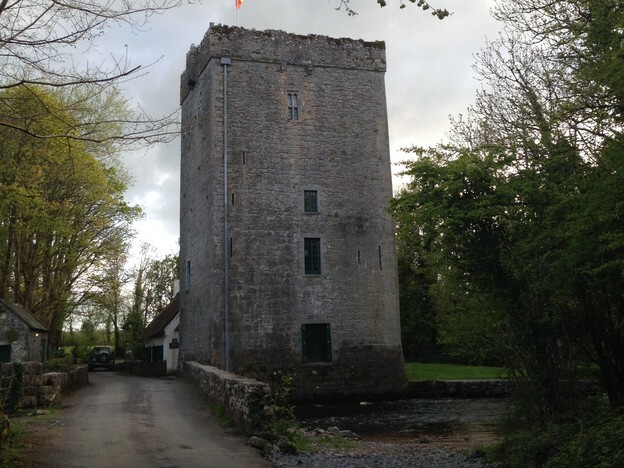 Yeats bought the tower (or fortress/castle, more accurately) in 1916 for a nominal sum, becoming, as one of his sisters noted at the time with a typical mix of wry humor and affection, the first Yeats to own property in Ireland. Thanks to the work of the Thoor Ballylee Society (including Adrian Paterson, my faculty exchange partner for the semester) and an eleventh-hour donation, the tower was able to open just before Yeats's birthday in early June. A night of music and poetry had been planned to celebrate the reopening of the tower, with its famous winding stair. So of course the first thing I did was find my way to the roof to take a selfie with the poet Sarah Clancy, who was supposed to be downstairs getting ready to read from her work. It was still light outside at 8, but we went, reluctantly, back down, to a large room where the charismatic Lelia Doolan presided over the festivities from a spot in the back, behind a full audience. There was music by Charlie Piggott and John Faulkner. Sarah and Mary O'Malley read from their poetry. Carmel Dempsey played crowd-pleasers, including a ghostly version of "Moondance," which, in the acoustics of the tower, was more von Bingen than Van Morrison. What was most interesting about the evening was the way that, by the end of it, the tower had not so much been restored to Yeats as taken from him. It became once again the overdetermined site that drew Yeats to it, a place that rather opened out onto multiple histories than defended itself against them. Sarah began her reading with a poem by an anonymous seventeenth-century poet; Mary O'Malley recalled Bachelard's phenomenology of height to describe the extension of the tower into sky and earth. Around 10:00, as the UK exit polls began to roll in, John Faulkner played a haunting version of the street ballad "McCafferty," with its story of defection from the British army. But the tower was perhaps most vividly present during a talk by Sister Mary deLourdes Fahy, whose family were Yeats's neighbors. She explained where the color of the staircase had come from and where the curtains were bought. This was not antiquarianism for the few; this was the material history of the many. Perhaps as a result, her Yeats was someone looking anywhere but to himself: lingering on the roads, gazing into space, wandering through local schoolrooms, staring at his shoes.